Earlier this week, I started seeing a lot of a buzz about the “Spooky” asteroid, 2015 TB145 set to pass close by to Earth on Halloween day. It was only discovered quite recently as it has an unusual orbit for an asteroid, well outsize of the ecliptic plane. In a previous post, I discussed the likelihood of a cometary collision. Comets are relatively few and far between, so impact probability with these is very low – though they are large and fast moving when they come in and contact would be catastrophic. There are many, many thousands of known asteroids or minor planets much closer to home and these are somewhat more likely to strike. Of course, the bulk of the asteroids are in the Main Belt and circling in a safe Indy 500 pattern out between Mars and Jupiter – there are likely millions out there large and small. The Trojan asteroids are in stable orbits of various kinds and are generally OK. Then there are the rogue NEO asteroids. While many of these are safely out of range, there are a number that we do have the potential to cross paths with. The NEO asteroids are generally smaller in size and don’t have cometary tails and so are quite hard to spot. A number of very powerful telescopes around the world are watching as constantly as they can to find and catalog minor planets of every type. (And they find most of the comets these days as well). But a new one could pop up at any time that could pose a threat. 2015 TB145 was found just a few weeks ago by the Pan-STARRS survey and this is an excellent example of why these surveys are very important. Still, there is a lot of room out there and luckily this pass of TB145 will be at a safe 1.25 times the lunar distance. The object is estimated to be 600m across. That’s not enough to be very bright normally, but at the closest approach the apparent magnitude was projected to increase to about 10 or so. This is not bright enough to see with the naked eye but pretty easy to spot in a modest telescope. At least, when the Moon is not out! The asteroid was projected to reach closest approach on Halloween day around 17:00 UT or 2 PM my time in the US Eastern timezone. But estimates of the brightness showed it to be visible on the approach around 4-6 AM local time, with a track along the top of Orion – but passing fairly close to a nearly full moon. I wasn’t sure if catching the flyby would be doable, but I set up my scope the night before and aligned it as described in the previous post. There were a number of articles on line with finder charts and tables giving locations for the passage. But with an asteroid passing this close, the apparent position against the star background varies significantly in different places due to parallax. So it looked like using a start charting program that can track and display solar system small bodies would be the best way to go. I recently upgraded my ancient copy of The Sky and used that, but a number of other packages have this capability including Stellarium. This very handily brings in all the values for you as-is without typing which is a huge help! But I wasn’t sure whether the program would give you the position of the body relative to the center of the Earth or calculated for my actual location. So I went to the JPL site to calculate the local ephemeris and had an hourly chart for that as well. 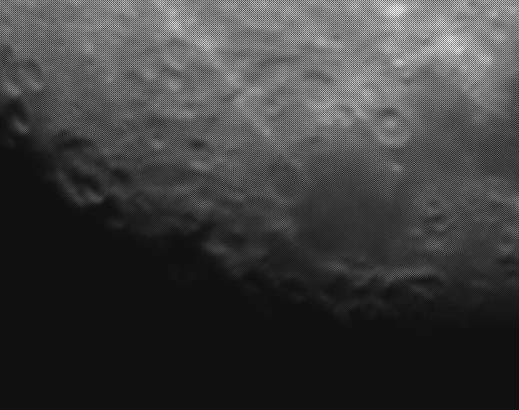 So after taking a few shots of the Moon as described previously, I pointed to the rough location of the TB145 and scanned a bit by eye just to see what would be visible. I could see a number of stars but not very many, so it was unclear whether I’d be able to see the asteroid or not. (At 600 meters across, I’m calling it an asteroid!). I had also recently bought cables allowing my CGEM mount to be accessed by a computer. 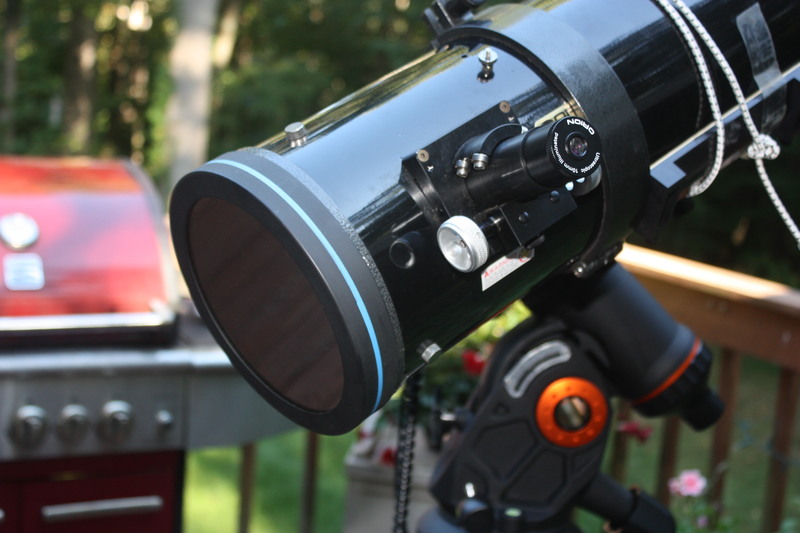 Celestron includes a program to do this, but a telescope interface is also supported by my version of The Sky, and this can be done by other packages as well. The hand controller has a telephone-style plug providing an RS-232 serial interface. I haven’t had a computer having one of these in quite some time, so I also had to get an adapter to convert to USB. I set this up the night before, and after installing the driver and rebooting, was able to find the telescope at a virtual COM4 and connected. With The Sky, when you connect the telescope, it’s position is displayed on the chart as a yellow circle so you can see where the telescope is pointing. Or at least where it THINKS it is pointing!You can also enter an object or coordinate and slew to that position from the program. I had never used a computerized mount before, so this was awesome! Of course, this is only as good as the alignment of the mount, but this seemed work quite well in the neighborhood where I had aligned to. The CGEM has functions to calibrate further but I thought I would give it a shot with the initial polar alignment and 2 star alignment. The smaller sized scope and DSLR give about a 1 x 1.5 degree viewing area, so getting in the ballpark would be good enough. 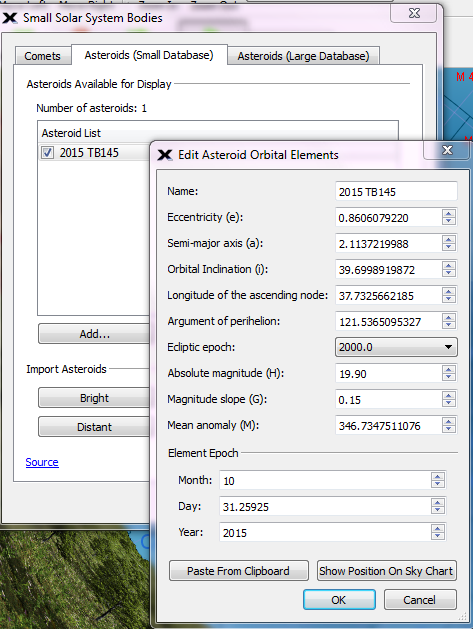 The display shows RA/Dec in Topocentric and epoch 2000.0 coordinates. I wasnt sure whether this compensates for the parallax or not, but it did seem to. At least, I did find the body in all of the shots given the position it provided! So I took and saved the shots, naming they by the group and approximate time of capture. I glanced at the images and could see a number of stars. There were a fair number of them and they looked in good focus so I just saved them without looking further. I guess I was expecting the asteroid to have a pinpoint star-like appearance with only a 10 second exposure. At least that was the case when I imaged a few main belt asteroids a while back – but those are much farther away! So I came in from the cold to have a look and tried looking at some images side-by-side. I could see bright pixel sized spots that appeared to move, but then noticed there were a lot of them and they would move or disappear at random! So these are hot spots and I guess you get more of these in an uncooled stock DSLR. Maxim DL comes with the blinking utility SN Search designed to look for supernova. That looks at pairs of images placed in 2 separate folders. So I took a few files and made copies to try it. After fiddling for a bit I worked out how to do the blink comparison and saw a faint streak that appeared to move in the first pair I took. I was able to find similar streaks in all 5 pairs, so it looked like I had it! The stars around the streaks can be easily aligned across the 3 images, but the streaks clearly travel in a line across the stellar background, so this appears to be TB145 passing by at a good clip. So this looks to be it, or at least some kind of fast moving object! I’ve yet to calculate the positions and confirm this is TB145, but I was able to see it in each group around where it was expected. 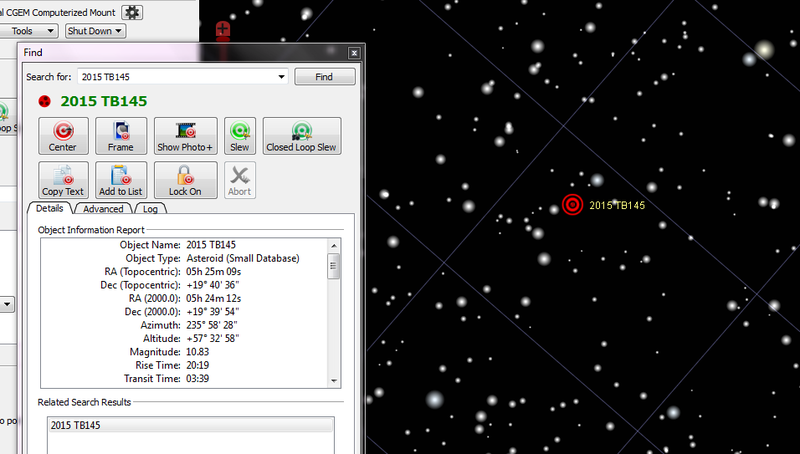 Next, I’ll look into how to calculate the position based on nearby stars and compare against the expected locations. This was very exciting to see and well worth getting up very early for. I was also watching reports on Twitter and saw a number of other people chasing TB145 early that morning and saw some great results. And I could not resist posting the above picture myself! While this did turn out well, there were a couple of lessons learned for me. For one, if I had looked more at the info provided by The Sky or other sources, I could have seen that the rate of movement of TB145 at the time was an expected 2.1 arcsec/sec in RA and 2.6 arcsec/sec in DEC. That gives a total movement of over 3 arc-seconds per second! So a 10 second exposure would show a movement of 30 arc seconds or 20 pixels or so at the resolution used. So I should have expected that the body would streak at this exposure time. Taking images 2 min apart would show a travel of 200 pixels which was a pretty good guess, though using a 1 minute interval and taking 4 or more would have given a more interesting collage. And with this rate, it would have been worth taking some time to look over the first set while I was at the telescope, as the streaks would have been pretty noticeable. But this turned out great all in all, and I’m very happy to be getting a handle on using the CGEM mount – with a small scope at least! 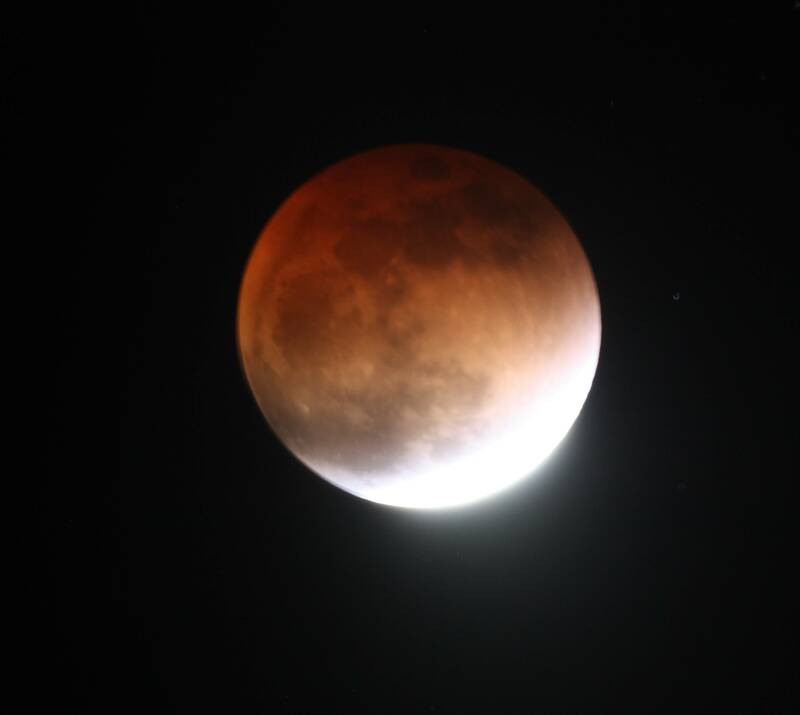 After getting a few fair shots of the recent Lunar Eclipse, I thought I would try taking some more pix of the Moon. One thing I noticed from the previous session was variation in the focus of the stars around the moon. I had refocused with each shot by looking through the viewfinder, but was obviously not getting that very consistent! Friends in my local astro club recommended using a Bahtinov mask to help with this problem. It’s a very clever focusing aid having a series of grid patterns at different orientations. 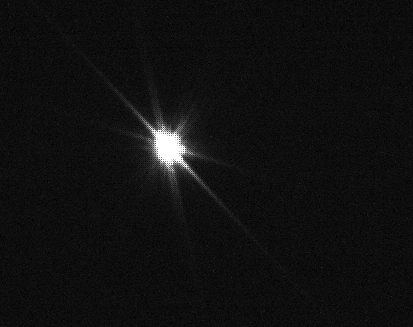 These create diffraction lines that converge to a common center when your telescope or camera is in focus, and diverge when off focus. This provides a very sensitive indicator of when you are at the very right spot. My clubbies offered to make a mask for me, but I found some reasonable ones on line and went the lazy way. The mask I got is plastic with some movable plastic screws you can adjust to fit around the end of a telescope or dew shield. It stays on pretty loosely but that seems to work out OK. I tried playing with this a couple of times and it seemed to work nicely, but I did not set up to take pictures. Then I went out very early in the morning yesterday to catch the Halloween asteroid 2015 TB145. Since a very big, bright moon was in the way, I took a few shots of that while waiting for the main subject to come up above the horizon. I had setup the scope the evening before and did a rough polar alignment and a single-star alignment. Since there were a number of bright stars visible in the early morning Fall sky, I was able to try and complete a two star alignment of the mount. That was the first time I was able to do so at home as I have so many trees around the house. This turned out to be very helpful in catching the asteroid later on! 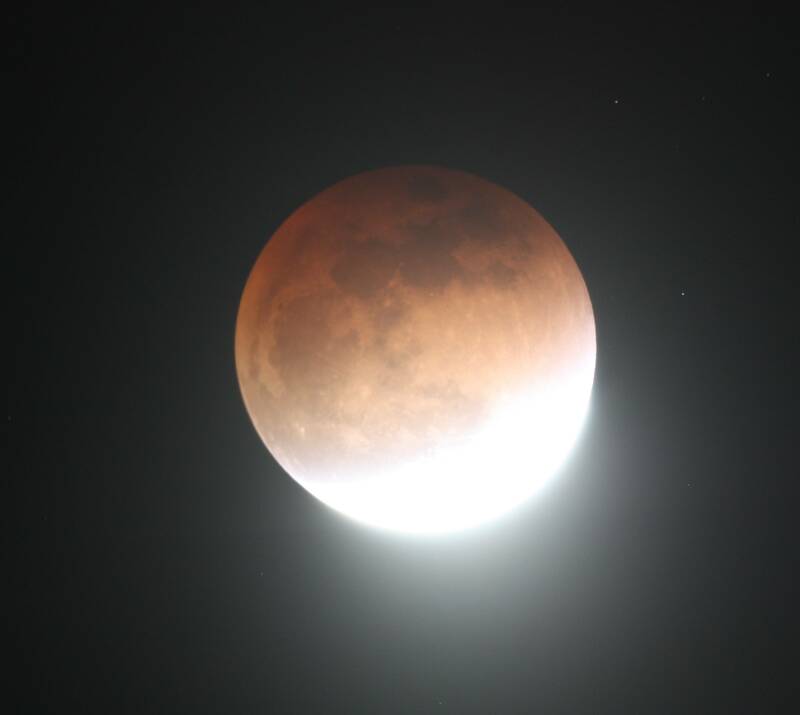 This looked reasonable to go with, so I slewed over to the Moon and tried taking some shots. The Moon was about 4 days past full but still very bright and up near the zenith at 4 AM. I tried taking a number of exposures down to 1/200th. Looking at the brightness histogram in Maxim DL, 1/100 seemed a reasonable exposure so I took a few shots at that time. You can see some smaller features but they are not very clear! Looking at this at first, I thought there was a problem with the capture – perhaps it was still out of focus some or getting blurred through vibration. But maybe the detail is about as good as it can be with this setup. The 6″ Newtonian used has a focal length of 750 mm, which is only several times higher that a decent zoom lens. 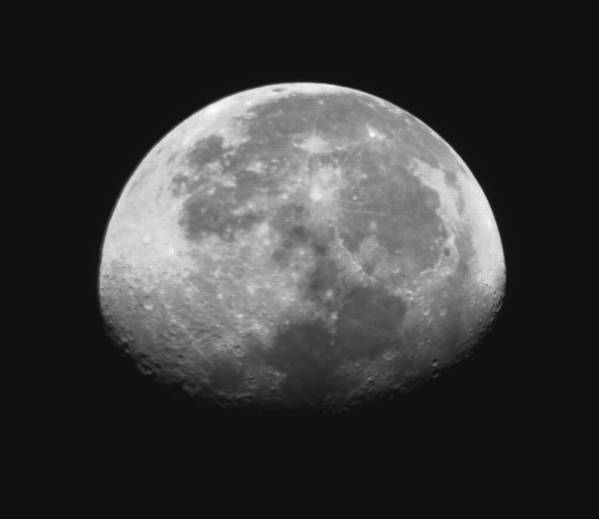 At this resolution, the Moon spans about 1350 pixels. With a diameter of 3500 km, the resolution is about 2.5 km / pixel at the center. So any feature spanning 5-10 pixels the eye can make something out of would be very big indeed! One way to increase the resolution is to get a longer focal length, so re-trying this with my C-8 would be worth doing for sure. Another approach is to take a picture of the magnified image through an eye piece – which is what you do when you look through a telescope. I could give that a try as well with the SLR but would also like to try getting a bracket for a phone camera and playing with that. After getting a few Moon shots I then tried taking some pictures to try to capture the “Halloween asteroid” 2015 TB145. That came out way better than expected, as described in the next post! After getting back into astronomy recently, one new development I’m really enjoying is the great abundance of astronomical events, exploration and research on social media. Following progress, discoveries and images from the New Horizons mission in near real-time on Twitter, for example, has been a thrill and quite addicting! But there has always been a fringe element around this subject, and that comes up in SM as well.Last month I saw some fear mongering about a major comet or asteroid due to hit the Earth in September, and subsequent rebuttal and denial by professionals. I don’t even want to post a link to the sites purporting this nonsense – but you could look it up! But it’s got me thinking about whether a really big celestial object could catch us by surprise..
I’ve also re-joined a local astronomy group and am looking forward to getting out with them again. Many of the members have changed, but they still have a core group of very dedicated observers. One of the former members I knew was a dedicated comet hunter, and would go out on many clear nights with a wide-field telescope or binoculars and scan the sky for fuzzy objects. To hunt for comets by eye, you have to become acquainted with existing nebula, galaxies and other fuzzy objects. In fact, Messier developed his catalog for this very reason! He had identified over 100 objects (and these have been added to), and today there are a number of more comprehensive catalogs for all of the “fixed” deep sky objects visible in the sky. The club also co-hosted a talk by Thomas Bopp a while back, who, of course, is one of the co-discoverers of the spectacular Hale-Bopp comet. He described stargazing with friends and noticing a faint fuzzy object he did not recognize. After checking start charts for known objects he suspected he had found a comet. After watching it for a while, he noticed movement, confirming that it was not a nebula or galaxy. He did not have a way to take a picture, so he sketched the comet relative to nearby stars and was able to work out a location for the new comet. Then he sent in the discovery the old-fashioned way – by telegram! Alan Hale is an avid observer and hunter of comets and had also noticed the new visitor and sent in his observations as well. The comet was confirmed to be new and was named for the two co-discoverers. When Hale and Bopp first viewed the comet, it was determined to be about 9 AU out from the sun or well over 1 million km from Earth. The comet was one of the largest and brightest seen in recent times and would surely cause major damage if it happened to hit the Earth, but how likely is that? After a newly discovered comet or minor planet is observed for a few days, it’s quite straight forward to calculate it’s orbital path. The motion of any body in orbit around the Sun was determined by Kepler and others in the 16-17th centuries and explained by Newton. Any body captured by the Sun will travel in an ellipse – or a perfectly round circle which is a specific type of ellipse. The orbit of the planets is roughly circular for the most part, but long period comets like Hale Bopp move in a very elongated or eccentric track. Hale-Bopp makes a trip around the Sun every 2500 years or so and when it comes to visit it approaches 0.93 AU before traveling way out to the fringes of the Solar System at 370 AU. It’s thought that it used to go further out before it’s orbit was brought in a bit closer by Jupiter. Given the orbital parameters for a comet, one can work out the probability for impact developed by Opik over 50 years ago and refined by scientists in the field since. The probability is determined by whether the orbits cross and how often, and the chance that both objects will be in the same place at the same time. This gets fairly complicated as the orbit of a comet or other smaller body is subject to precession as well as perturbation by other bodies. So the orbits can align from time to time increasing the chance of a crossing. But since there is lots of room out there and the visits infrequent, the collision probability from a long-period comet is estimated to be in the tens or hundreds of millions per year per potential impact. Perhaps people imagine the probability of these collisions to be more likely than this very small number because of the pictures we’ve all seen of the Solar System. These are fine conceptually but impossible to draw at actual scale. As this page from the NOAO shows, if the Earth were represented as a small peppercorn, or about 1/10 of an inch across, it would be located about 25m from the Sun. And Hale Bopp would travel about 10,000 m away on every orbit, coming back every 2500 year for another shot. Another awesome, live scale model was made recently by Wylie Overstreet and Alex Gorosh in the Nevada desert and posted here. So I don’t see how a big comet could take us by surprise, but we’ll soon see! Anyhow I’m still waiting for Planet-X to end us, which was another doomsday hoax propagated on Usenet a while back. Perhaps things have not changed so much after all..
I’ve been wanting to get a new telescope mount for years – something that tracks better for taking astro pictures. Of course, I would go online from time to time and window-shop at the high-end professional mounts – but I don’t have the five-figures to spend on one or even enough sky to make use of it if I did! I’ve been eyeing the Celestron CGE line for a while and was doing some price comparisons recently. The DX model was listed for under $2000 at all the sites I checked, including a major on-line retailer I frequent. That was too good to resist so I just had to click on Buy! I’ve also been tinkering with an old telescope I have since it looked to be a good match for my Canon DSLR – an Orion SkyView 6″ Newtonian. I think it’s a great first telescope and I’ve always found the views to be quite crisp – especially after getting a decent right-angle mirror and an eyepiece or two.. When I tried attaching my Canon 450D to the scope I found it could not quite reach focus. Not surprising as the focal plane on these is usually pretty close in to the tube. I had a focuser I had bought for this scope and never got around to putting on, so I removed the old one, drilled holes to bring the new one in a little closer. I also had to drill out a new CGE dovetail plate to mount it, but then was good to go! 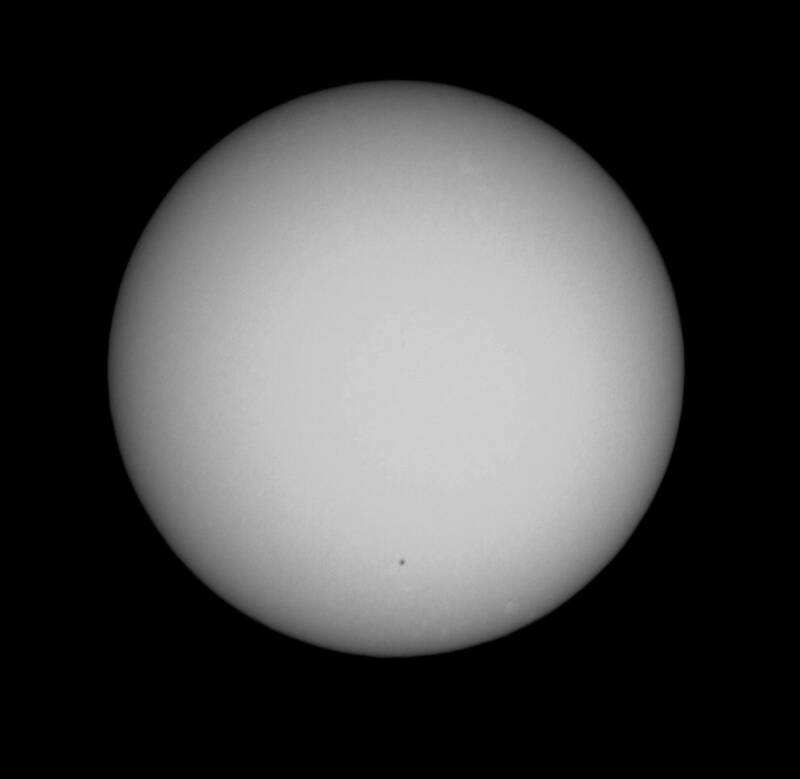 The CGE mount will let you align on the Sun if you enable that option in the setup. So I angled the mount to point roughly North and ran a Solar System alignment on the Sun. The display prompts to center the object in the finderscope, which I didn’t have on of course. So I did a rough pointing by looking at the shadow cast by the telescope tube and then the hinges of the tube rings. That was enough to center the Sun in the eyepiece (with a filter on the telescope of course!) and then confirmed the alignment. The mount tracked quite well East to West but needed a little nudge to the North from time to time, but this was good enough to get some pictures! One feeble spot is pretty clearly visible at the bottom center. With an array of 22.2 x 14.8 mm and a focal length of 750mm that works out to 6105 x 4070 arcsec or 102 x 68 arc min. Not bad! With a width of 4070 arc seconds and 4272 pixels, that works out to 1.4 arcsec / pixel. Seems this is classically considered a good match, though perhaps it depends on what one wants to take pictures of. In any case, this should be a nice setup for brighter wide-field objects, so there will be plenty of things to try to catch.